Successful Wellness Programs = Commitment + Strategy + Tangible Support Launch a sustainable health promotion program OR expand an existing program and your practice could be eligible to receive financial assistance through the Practice Wellness Grant Program. Building an effective and successful health promotion strategy requires support. The NCMS Plan is pleased to announce its Practice Wellness Grant Program designed to provide financial grants to participating groups that achieve CORE components and completion goals defined as key elements of an effective health promotion program. Meeting with NCMS Plan Promotion Manager to review grant program Participation/Outcome based incentive strategy integrated into practice’s benefit plan structure. A. Coordinate a financial seminar for employees (i.e. personal finances, budgeting or retirement planning). B. Training/workshop that addresses weight management, stress management, resilience, or building individual capacity. 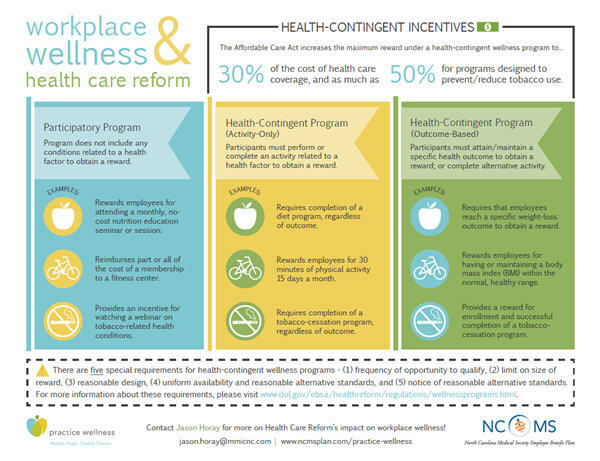 NCMS Plan’s preventive benefits and wellness resources promoted to practice population. Annual preventive care exam and/or age/gender appropriate screenings completed by 75% of enrolled employees. Creation and communication of at lease ONE written wellness policies (i.e. tobacco free, healthy eating, work/life balance, wellness participation, physical activity) For practices with an existing comprehensive wellness program as determined by the NCMS Plan Health Promotion Manager, a practice may submit a grant proposal outlining alternative programming for the Grant Review Committee to consider. Health Assessment completion by 75% of enrolled employees. Commit to a coordinated 45 minute educational/skill building workshop with at least 50% practice participation. Note: Unless otherwise indicates, all chosen components must be completed within a 12-month period from the effective date of implementation. The minimum grant is $250 and the maximum grant is $20,000.